Work continues on our addition and lift as we continue our efforts to make the second floor accessible. We are hopeful that a number of grant applications made late 2010 will allow us to complete the façade restoration and renovate the second floor. We are looking forward to a partnership with Pathways to help us with the demolition work on the second floor. Thanks to a team of a dozen people from Pathways Skill Development, our second floor is ready to be renovated. The team worked three weeks and tore out the damaged walls and ceilings. Then they skillfully repaired the hard wood floor where it had been damaged from a leaking roof, before we purchased the building. They also added insulation to the ceiling in the rear section of the building. Thank you Pathways for your hard work on our building! The addition, which has a new accessible entrance in the rear, and includes a lift and stairway to the second floor, has also been completed and is functional. We now have a way for everyone to get up to the second floor. We continue our work in requesting funds from various private and public entities to complete the façade and second floor restoration. 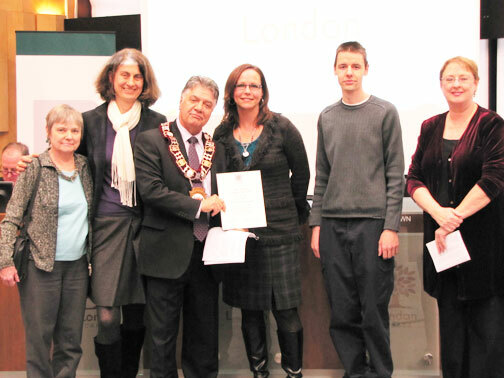 The London Potters Guild was recognized as a Featured Organization at the Monday, February 7 City Council meeting. Thanks to a $405,000 grant from the Community Capital Fund, the London Potters Guild is closer to reaching its goal of full restoration of 664 Dundas. Huge thanks to MPP's Deb Matthews, Chris Bentley, and Khalil Ramal for announcing the grant and helping us celebrate. Restoration to the front façade will begin this winter and will be completed by spring. The second floor renovations will be complete by December 2012. This is a matching funds grant, and we are still gathering funds. All donations, large or small, are gratefully accepted. This project strengthens the Old East Village while building an arts centre that will serve generations of clay enthusiasts in south western Ontario.